Click here for final scores. The Final scores for Divisions B and C at the Los Angeles County Regional Science Olympiad competition held at Rio Hondo College have been posted. Final scores are not reviewable. The Final scores for Division A at the Los Angeles County Regional Science Olympiad competition held at Occidental College have been posted. Final scores are not reviewable. 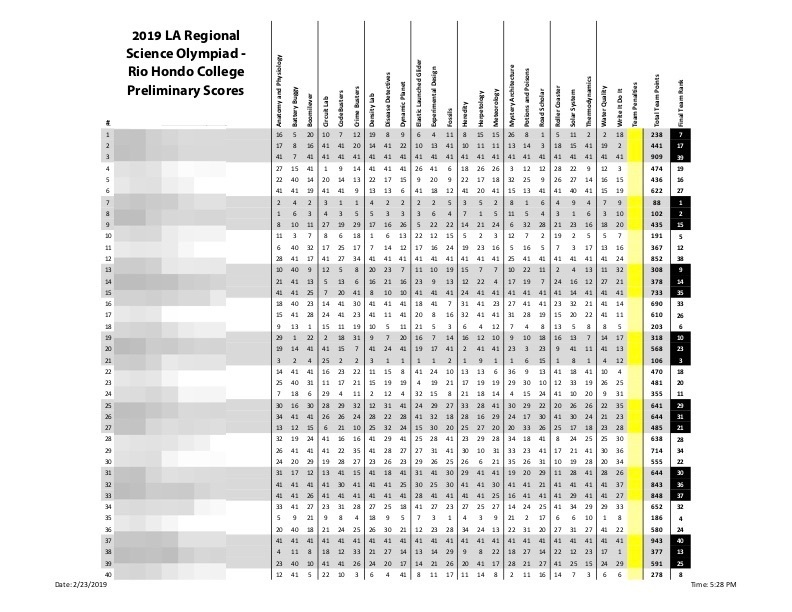 The PRELIMINARY scores for Division A at the Los Angeles County Regional Science Olympiad competition at Occidental College have been posted. All scores are under review and will be verified as final later. A FINAL Schedule of Events for the Division A tournament at Occidental College has been posted. This schedule was updated on 2/28/19 at 10:00 AM. Make sure you have this latest copy. Check the Rain or Shine update page For Coaches regarding the ;weather for the Occidental College competition. This page will be updated if necessary. See you Saturday! The PRELIMINARY scores for Division B and Division C at the Los Angeles County Regional Science Olympiad competition at Rio Hondo College have been posted. All scores are under review and coaches have until 5 PM, Tuesday, February 26, 2019 to report possible discrepancies. FINAL schedules of events for Divisions B and C tournaments at Rio Hondo College are posted. The modified rules for Pasta (&Meatball) Mobile have been posted in Rules/Updates > 2019 Division A Event Updates.